Veterinary medicine clinical professor Dr. Laura Garrett with Titan. 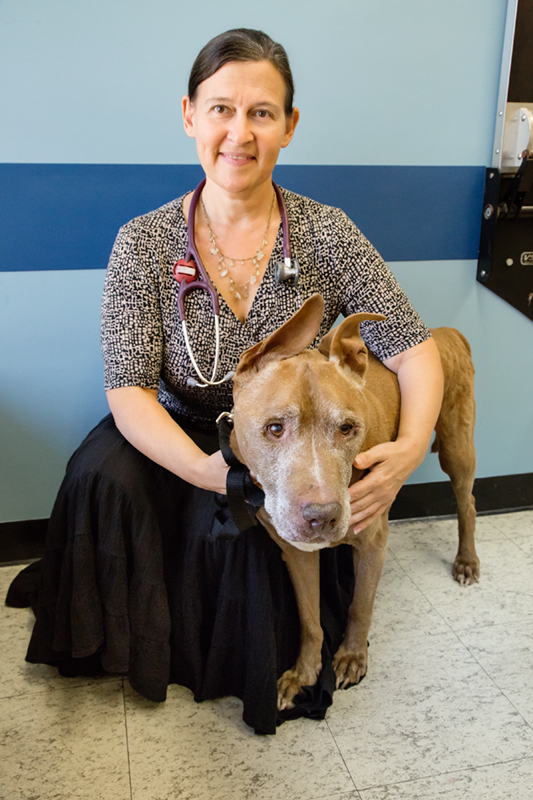 The first time I see Titan, a pit bull with mesothelioma in his chest, I give his owners “the talk.” The dog is breathing hard and fast because of the buildup of cancerous fluid around his lungs. Dogs develop some cancers that are very similar to human cancers. This is one that we don’t see very often and for which we don’t have really good treatment options, just like in humans. Titan’s owner is there with her mother and two-month-old baby. We talk about Titan’s poor prognosis. We will give the dog chemotherapy intravenously and, after pulling out as much fluid as we can, we’ll also inject chemo into the chest. This helps some animals, but most don’t improve a lot. The best-case scenario for Titan, I tell his family, is that he might get another six months. It’s three weeks until Titan’s next appointment. I haven’t heard from the family, and I secretly worry the dog had to be euthanized. 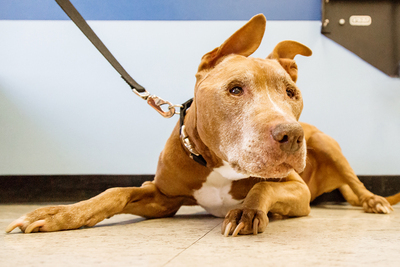 But the family comes in for the next appointment, and it’s clear that Titan is doing better. We look at his chest with ultrasound and see that there is still a little fluid in there. Again, we draw off the fluid and inject chemo into his chest and vein. Three weeks later, Titan returns – with no buildup of fluid in his chest! We start giving him intravenous chemotherapy every three weeks. This lasts for nine months, with no side effects and a good quality of life for Titan. But then he starts having trouble walking. There is no sign of cancer, but Titan has an infection in his spine. We take a break from the chemotherapy because it can inhibit the body’s ability to fight infection. We put him on antibiotics appropriate for that sort of infection. Titan responds to the antibiotics. The walking problems go away, but after two months without chemo, the cancerous fluid comes back into his chest. The original chemo drug doesn’t help this time, so we decide to try another. I tell the family that we’re eventually going to run out of options; at some point, he’s not going to keep responding. After the first dose of the new drug, however, Titan improves. After the second, he has no more fluid in his chest. We’re out two and a half years now, and the family has had another baby. Despite growing a young family and having jobs and living nearly two hours away, the family returns every few weeks to get Titan his treatment. Titan, however, had another hurdle to clear: Last winter, the family got into an accident in an ice storm while they were on their way here – a car crossed over into their lane head-on. Fortunately, the human family members had only limited injuries, but Titan was seriously hurt. He couldn’t walk. The fighter in him rose to the occasion, however, and over a few months of pain medication and treatment, his orthopedic issues improved. Titan has survived cancer, an infection and a car accident. I’ve learned a lot about perseverance from Titan and his family. 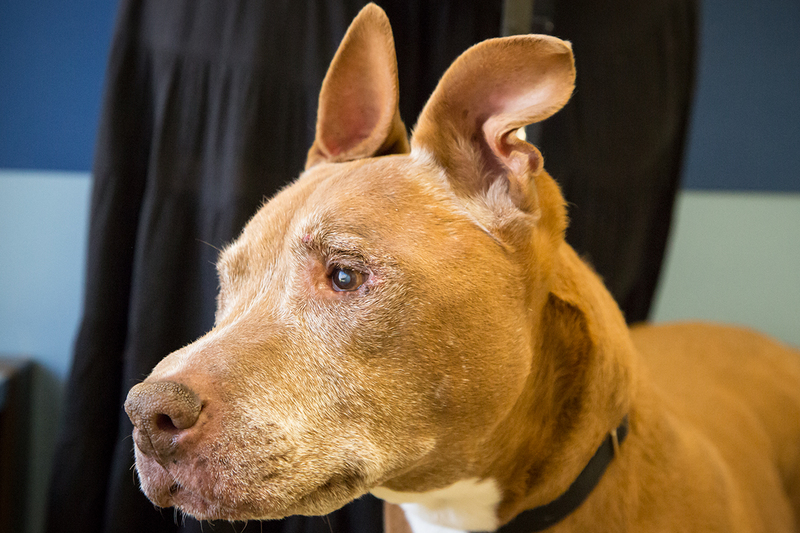 Even in the face of really bad treatment-resistant disease, our therapies, a dog’s heroic strength and a loving family’s persistence and care can lead to outstanding responses. And that’s why we do it. Today, at age 14, Titan is still going strong. 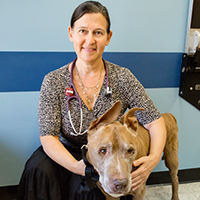 Editor’s note: Dr. Laura Garrett is a professor of veterinary clinical medicine and a clinical oncologist at the U. of I. College of Veterinary Medicine.